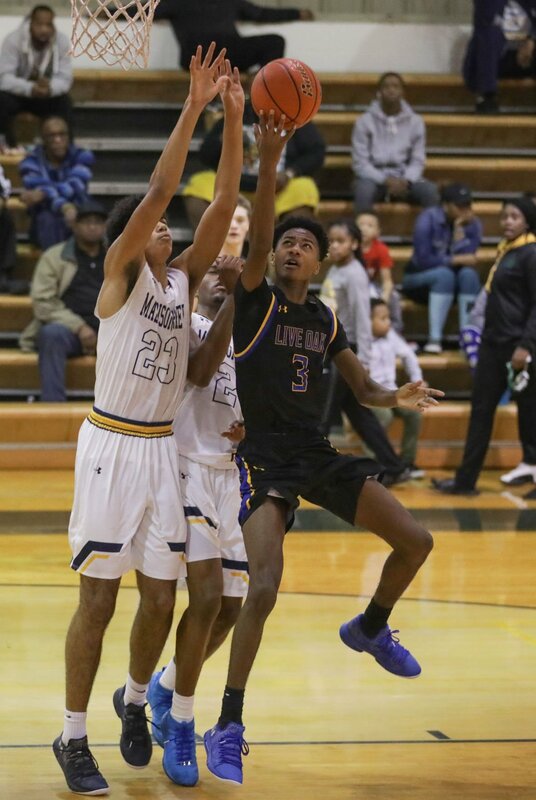 Live Oak's Bryan Bayonne (3) shoots against Madison Prep's Percy Daniels (23) and Jahein Spencer (2). Live Oak's Ahmad Pink (21) reaches out to secure a loose ball. Live Oak's Vince Bayonne (1) pivots to shoot against a Madison Prep double team. Live Oak coach John Capps has his Eagles with a No. 8 power rating in Class 5A. Live Oak's Bryan Bayonne (3) drives past Madison Prep's Jahein Spencer (2) in the Walker Christmas Classic. Live Oak's DaDa Capling (5) drives past a Madison Prep defender. Live Oak's Vince Bayonne (1) kicks a pass outside against Madison Prep's Percy Daniels (23). Live Oak's Darian Ricard (2) drives between Madison Prep's Jahein Spencer (2) and Dezeil Perkins (4). Live Oak's Halen Cox (24) drives inside. Live Oak's Darian Ricard (2) looks for an open passing lane against Madison Prep's Marcus Guss (10). Live Oak's Vince Bayonne (1) drives past Madison Prep's Deziel Perkins (4).